Doug Peterson was born in 1935 in Omaha, Nebraska. He enlisted in the U.S. Air Force on November 5, 1954, and entered the Aviation Cadet Program in June 1955, receiving his commission as a 2d Lt and his pilot wings on September 28, 1956. After completing F-84 Thunderjet Combat Crew Training, Lt Peterson served as an F-84 pilot with the 612th Fighter-Bomber Squadron at England AFB, Louisiana, from March to September 1957, and then as an F-100 Super Sabre pilot with the 22nd Fighter-Day Squadron at Bitburg AB, West Germany, from September 1957 to September 1960. His next assignment was as an F-100 pilot with the 522nd Tactical Fighter Squadron at Cannon AFB, New Mexico, from September 1960 to February 1963, followed by F-4 Phantom II Combat Crew Training and service as an F-4 instructor pilot with the 4453rd Combat Crew Training Squadron and 4453rd Combat Crew Training Group at MacDill AFB, Florida, from February 1963 to January 1964. Capt Peterson served as an F-4 pilot with the 557th Tactical Fighter Squadron at MacDill AFB and Eglin AFB, Florida, from January to April 1964, and then as an F-4 pilot with the 4485th Test Wing at Eglin AFB from April 1964 to June 1965. His next assignment was as an F-4 pilot and as Chief of Stan/Eval with the 33rd Tactical Fighter Wing at Eglin AFB from June 1965 to June 1966, followed by service as an F-4 pilot with the 433rd Tactical Fighter Squadron at Ubon Royal Thai AFB, Thailand, from June 1966 until he was forced to eject over North Vietnam and was taken as a Prisoner of War on September 10, 1966. After spending 2,368 days in captivity, Maj Peterson was released during Operation Homecoming on March 4, 1973. He was briefly hospitalized to recover from his injuries at Keesler AFB, Mississippi, and then served as Air Operations Officer with Headquarters Tactical Air Command at Randolph AFB, Texas, from December 1973 to July 1974, followed by the National War College in Washington, D.C., from July 1974 to July 1975. 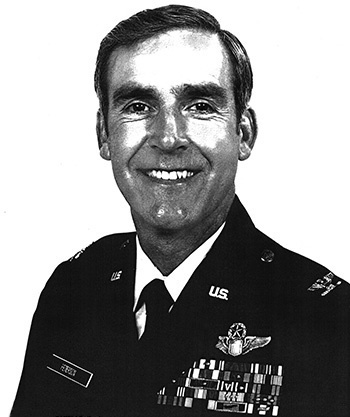 Col Peterson next served as Chief of Operations Plans for the 354th Tactical Fighter Wing and then as Deputy Commander of the 354th Combat Support Group at Myrtle Beach AFB, South Carolina, from July 1975 to September 1978. His final assignment was as Commander of the 4th Combat Support Group at Seymour Johnson AFB, North Carolina, from September 1978 until his retirement from the Air Force on December 31, 1980. After retiring from the Air Force, Doug earned his Ph.D in finance from Central Michigan University and then served as a professor at Florida State University before serving as a congressman in the U.S. House of Representatives for Florida's 2nd Congressional District from January 1991 to January 1997. Doug Peterson was appointed the first Ambassador to Vietnam on April 11, 1997, and served until July 15, 2001. Captain Douglas B. Peterson distinguished himself by gallantry in connection with military operations against an opposing armed force near Hanoi, North Vietnam on 3 September 1966. On that date, Captain Peterson conducted a night strike on a vital supply and storage area of the hostile force in a highly defended area. With complete disregard for his own safety, Captain Peterson continued the attack in the face of intense defenses to deliver ordnance on the target, completely destroying the target. By his gallantry and devotion to duty, Captain Peterson has reflected great credit upon himself and the United States Air Force.